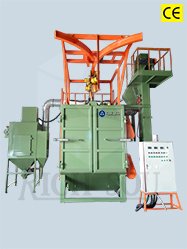 The machine is widely applied for removing sand and surface blasting on big and medium cast iron parts. blasting, providing full satisfaction to all customers. Lifting capacity of hanging shafts over 2 tons are single rail construction and double bevel construction for capacities under 2 tons. When requested, a double bevel type shot blasting machine is available, especially ideal for precision cast iron factories and aluminum alloy parts factories. ■The door equipped with PENUMATIC valve for safe door opening and closing. ■The double bevel mechanism has rail exchange function. When one shaft is performing blasting,the other shaft is performing parts replacement at the outside for saving time. 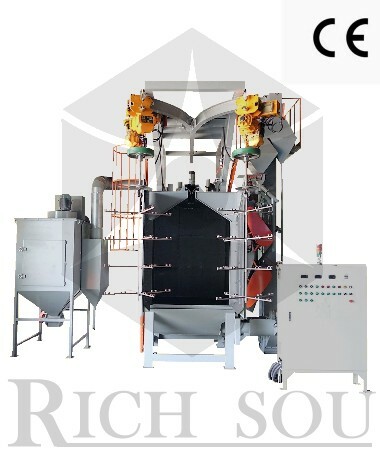 Steel shot recycling system: Screw Conveyor is equipped with a sieving screen for separating big grits,which will then be emitted automatically. ■An air operated steel shot separator, built on the elevator, fully separates steel shot from heavy grits & dust to reduce the consumption of wear resisting parts. ■Equipped with a steel shot storage tank and an adjustable steel shot supplier (manual adjust by air control), ensures a certain constant steel shot supply and shorten the blasting time.